Recently on the Jim Bakker Show, on October 17, 2017, Jim Bakker decided to speak for God. During the show, Bakker berated and belittled those who dare question his authenticity as a “profit.” Baker tried defending his past pathetic prophetic utterances by declaring that “when God says something to you, you don’t always know the exact time it is going to happen.” Then he went on to declare that God gave him 31 prophetic visions. What Bakker does not mention is how many of the 31 vision he got wrong. The Bible is clear about what we should do to those who claim to be prophets of God in Deuteronomy 18:22 and get but even one prophecy wrong. While I am not advocating anyone stone Bakker, it is clear that Bakker should be removed from any form of “speaking” for God or ministry work. It is clear that God is not the author of confusion, so when God in the Bible has given visions, He has done so with specific time frames, not with unknown timing as with Bakker’s visions. As much as Bakker would like to claim that he receives visions from God it is just not true. While he may be receiving visions, which is arguable on its own, they are not from God, meaning they can be from only one other place. Bakker claims to know the mind of God, and those thoughts miraculously side with Jim Bakker. This self-proclaimed ability to understand what God would think in this situation is not only pathetic but dangerous and is what many cult leaders use on their followers. 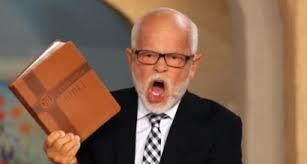 Jim Bakker, you want people to “just go away” and not try to destroy you? Then stop your false teaching along with your modern-day Montanist heresy and repent. At that point, people like myself and others will go away. Until then we will continue to point out the hypocrisy and error in your teachings.